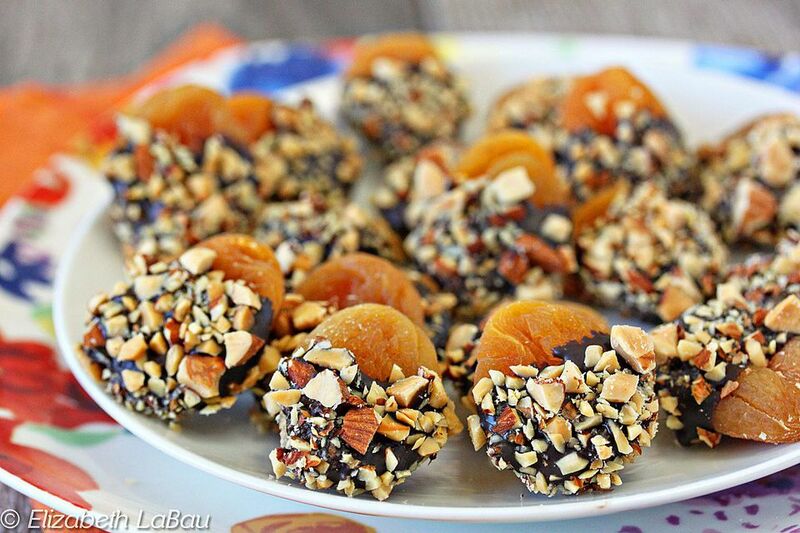 Chocolate-Dipped Apricots are one candy you can feel good about eating! These quick and easy treats are made with dried fruit and heart-healthy chocolate and almonds, so you can indulge without guilt. They make a wonderful gift or a nice afternoon pick-me-up. Try substituting other dried fruit, like peach slices or mango, for the apricots. If you want a sweeter candy, substitute white or milk chocolate instead! Prepare a baking sheet by lining it with parchment or waxed paper. Place the chopped almonds in a small bowl. Melt the chocolate or candy coating in a small bowl in the microwave, stirring after every 30 seconds to prevent overheating. Holding an apricot by the tip, dip most of the fruit into the melted chocolate. Remove it from the chocolate and drag it along the lip of the bowl, removing excess chocolate. Sprinkle both sides of the apricot with chopped almonds. Place the candy on the prepared baking sheet, and repeat for the remaining apricots. Place in the refrigerator to set the chocolate for approximately 10 minutes. For the best taste and texture, serve at room temperature.